Card holders are not just a safe place to store your membership, loyalty or hotel key card, they can also be a portable marketing tool. 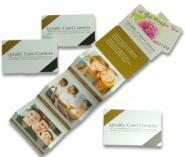 Products such as our Card Carrier Foldilocks and the Card Carrier Swatch are two perfect designs. 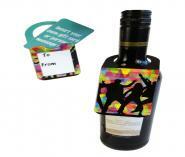 Both have lots of print area and make eye-catching and unusual membership card holders, gift card holders, loyalty card holders and even sim card packaging. The Foldilocks card holder design is ideal for issuing discount coupons to encourage brand loyalty or producing for a time-staged incentive offer. The swatch style card holder has a great area to print a selection of services, product ranges, or even other premises within your group of companies. The Card Carrier Extenders are perfect for creative and attractive gift card presenters, hotel key card holders and sim card packaging; having an extending sleeve to hold and protect the cards is an added bonus. Adding glamour and prestige to your membership card holders and gift card sleeves is easy with the Card Carrier Starburst which opens up in a theatrical way to reveal extra information. The Starburst Fold is popular in many formats but particularly with the gift card holders, loyalty card holders and membership card holders. 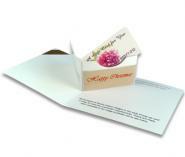 Gift card carriers with an extra dimension are an ideal format to use for extra advertising to encourage brand loyalty. We are all receiving more and more reward cards and loyalty cards and the Card Carrier Starburst is a loyalty card wallet that is easily found in a cluttered handbag whilst keeping the card protected. 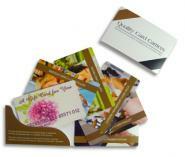 The Card Carrier V-fold and Card Carrier Parallelogram have both earned a first class reputation as the gift card sleeve of choice for blue chip companies. Both these two gift card sleeve designs are perfect for corporate gift card carriers, each adding a prestigious feel and kudos to the promotion. The Card Carrier V-fold is surprising and entertaining and the Card Carrier Parallelogram is celebrated as a feel-good factor product. The whole concept of relationship marketing features below the line marketing tactics. Loyalty schemes, rewards and incentive schemes are all designed to encourage customer loyalty to your brand and in order to increase the feel good factor, the clever customer relationship marketer will award his customer free membership of the customer reward scheme. Membership cards, loyalty cards and reward vouchers should all be presented in card holders that befit a prestigious gift - such as any one of our quality card carrier range. 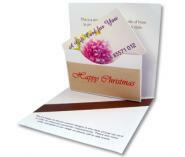 The success of the scheme is not only counted in repeat business but also in brand awareness and a quality gift card holder will add prestige to customer relationship marketing branded cards. We have two pop-up card carriers - the v fold pop up card holder and the parallelogram pop up card holder - plus an extending card carrier, each of which will work perfectly for key card holders too. Humble card holders are capable of much more than you think. 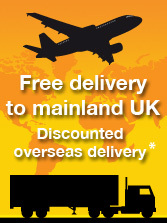 Marketing below the line is not confined to presenting reward cards and loyalty coupons. Building a brand name and promoting brand quality is also of great importance and this can be achieved in different ways. Let's take hotel branding as an example. 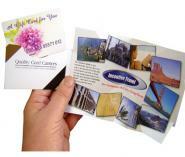 Your room key is often presented within a simple folded card. How much more impressive would that be if the key card holder opened to reveal a map of the local area including sight-seeing attractions, places of interest and directions to the hotel. This is something that you would keep and refer to regularly during your stay at the hotel thereby adding to your impression of the hotel just like the chocolates on your pillow and other nice touches which increase your chances of using other hotels in the chain. This is an excellent example of below the line relationship marketing. 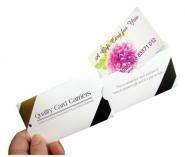 Our Starburst Card Carrier is ideal for customer loyalty marketing in this circumstance.